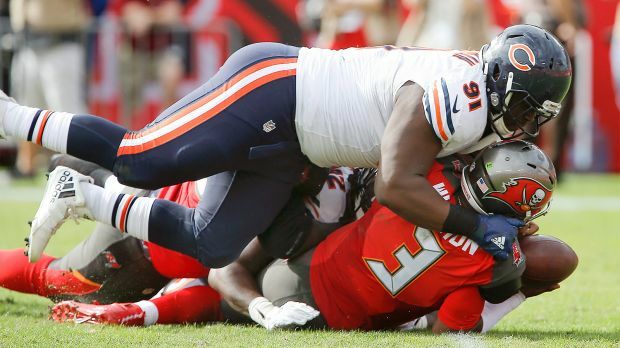 The development and production of Eddie Goldman was one of the best things to happen to the Bears this year. Goldman was billed as a run-plugging nose tackle and a two down player. He proved to be much more. He had 4.5 sacks and was third on the team with nineteen quarterback pressures, according to the official statistics released by the team. He’s technically listed as a nose tackle, but he’s just as much an end in the Bears defense, lining up over the guard as often as he lined up over the center. Outside of what is considered their base defense, Vic Fangio used Goldman similarly to how he used Justin Smith. Forget about what positions they’re listed at, Smith was Fangio’s anchor in San Francisco and Goldman may be his anchor in Chicago. 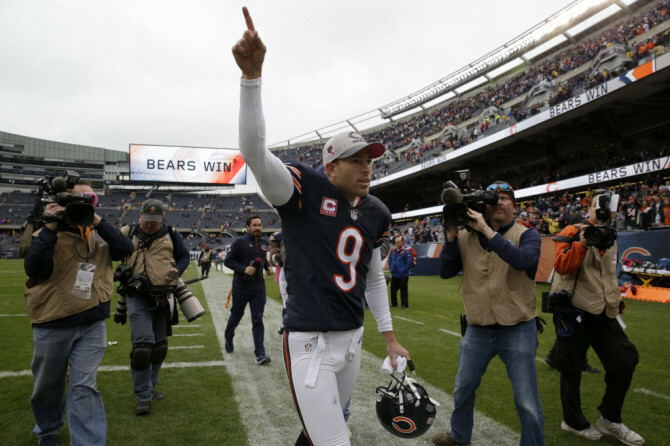 The Bears have a few players who could be rotational but no other lockdown starters. Jarvis Jenkins won fans over with a 10-tackle, two-sack performance against Seattle in Week Three but really didn’t do much the rest of the season. He was fourth on the team with 17 pressures, but a major liability against the run. As unpleasant as any conversation about Ray McDonald may be, there is still a football discussion needing to be had as the Bears must now replace a potentially key part of their defense. There’s no question the Bears made the right call in cutting McDonald. He needed to prove he could stay out of trouble and he didn’t. By releasing him they became a better organization. But they will be a worse team if young players don’t step up because McDonald was going to be the team’s best defensive lineman. The amicable Augsburger and vivacious Vandermoon are competing for a pair of tickets to a Chicago Bears game this coming season. The reminder of the rule submission for this final draft day is after the break. Note on the draft. The Bears brought nine defensive linemen into the 2013 season; four tackles and five ends. Right now you can essentially guarantee Jared Allen, Willie Young, Lamarr Houston, Nate Collins, Jay Ratliff, Ego Ferguson and Will Sutton are on that roster. (If you also include Izzy, we’re already at eight.) 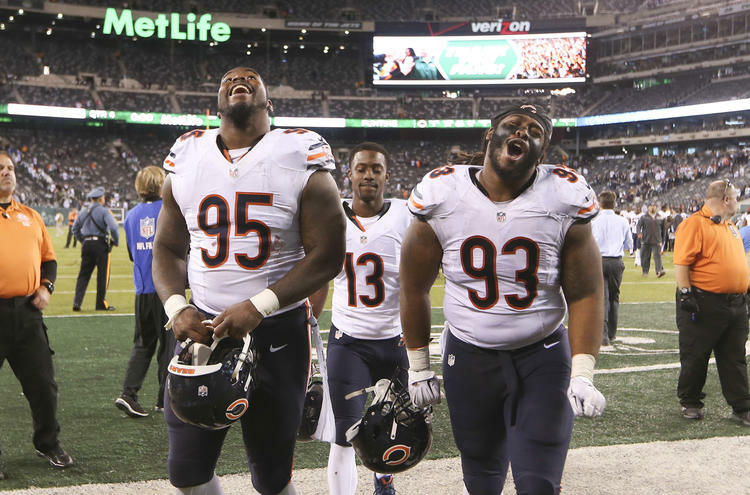 So…the Bears defensive front will have a significantly different look in 2014. Let’s hope Emery’s touch is as good on that side of the ball. Names to watch today: Wisconsin running back James White, Princeton DT Caraun Reid, USC S Dion Bailey. I shall have a full draft wrap-up on Sunday. STRENGTHS: Tall, well-built frame with well-proportioned bulk from head to toe. Flexible body type with natural bend, controlling his momentum well when he stays low with impressive change of direction skills for his size. Long arms and quick hands, using his strong limbs to press and lock out.